The reduction of absolutes in our daily thinking would improve our functioning in the world. 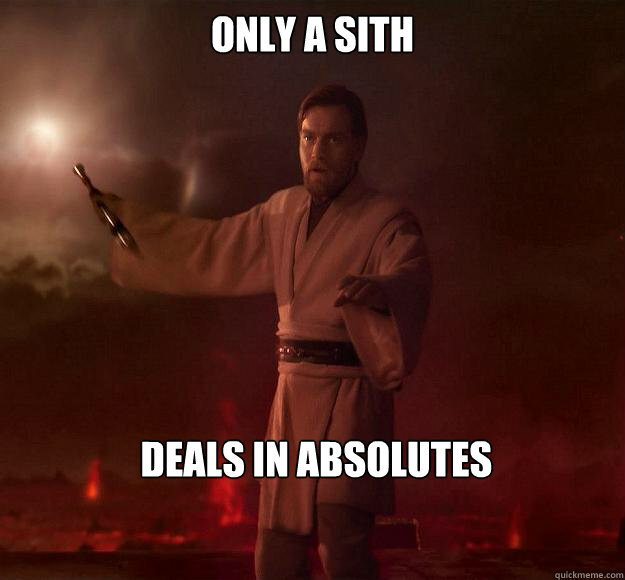 A new friend recently explained that she tries to limit “absolutes” because she isn’t judgmental. Of course, she when on with biblical references and might have tossed in Tupac’s statement about God and judging. Whatever, my big takeaway or teachable moment came from the absolute part. The dictionary defines absolute as “free from imperfection, complete, perfect; free from restrictions or limitations.” If you think about it, ignorant people like Donald Trump walk around all day talking about “all” this and “every” that. For the record, Trump is brilliant…he just plays dumb on T.V. to build his brand. Would someone please tell the ignorant that fashion comes and goes but style remains the same…furthermore, fashion is a cruel scheme created to separate you from your little money. Often, people with sensible style use saved money to buy HOUSES…but you just keep on making Michael Jordan and Michael Korrs rich. Speaking in absolutes indicates your mental limits and I can write that because people like that wouldn’t read 200 words down into an article or blog post. (Smile) Let’s talk about them. All Jewish people have money. Every Black person is looking for a handout. All Blacks with nice cars are selling drugs. All poor Whites drink Mountain Dew. All Asians are good at math. All women date for money. Everyone should worship like you. Every White person is exactly like the few Whites you have met. Everyone in the hood is up to no good. Everyone in a fancy community got there from fair dealing. All teachers really want to do another job. Everyone must pay to play. All hip hop is bad. All hip hop is good. Every man cheats…a man is going to be a man. Every southern White person wants to still own slaves. All limitations on Blacks come from Whites. Everyone in the world is out to get America. Everything the U.S. government does in the world is good. All Mexicans want to take my job. All Frenchmen want to take my wife. Nobody wants my wife…including me. Everyone in the Pacific Northwest is a candles and sandals liberal. No White southerners are Democrats and they couldn’t wait to get the hell out of a party with Negroes. Everyone in a hoodie is a thug. Everyone who loves NASCAR wants their country back. All gay people are trying to recruit you because you are irresistible. All lesbians had daddy issues. All successful Black women should consider dating the above mentioned White woman’s equally ugly brother because all Black men are in jail, gay, broke or cheaters. Every woman in high heels is a floozy. Every woman in low heels isn’t a floozy. All private schools are better than all public schools. All social media is evil. All wine is bad for you….read your Bible. All pickup truck drivers are rednecks….must stop now, need to go wash my truck. This humorous list could go on and on but the point is made. We must think with more understanding and complexity. “All” and “every” could be replaced with “most” or “most that I have met in my limited life.” You know the real deal is this: people with mental and cultural limits don’t realize how dumb they are and get used by manipulators time and time again. Businessmen were at home when the Klansmen were doing their dirty work…well, some were right there in the mix. Some rappers are negatively shaping our community’s culture while other folks reap the benefits. Everyone should be mindful of what they say out loud. The Trump supporters aren’t new…they just decided to say out loud what they had been thinking for years. Malcolm X would have thanked them for their honesty because honesty is the starting point of most productive dialogs. Change in my community that starts with the election of Barrack Obama is a good time to stop using the N-word. Obama and his Red, Black, White and Brown supporters grew up in sweeter parts of the nation than me or the southern ones are the next generation of less bitter people—that’s wonderful. We should have compassion for those who are “limited” for whatever reason. In doing my little part for “change,” I will refrain using the N-word and I have never been big on the B-word. I am replacing both words with “fool.” As children, we could not say fool in my family—which was odd because we clearly had some fools around.